The planets in our solar system all orbit in the same general plane. They aren’t exactly aligned, but their orbital planes are all within a few percent of each other. Some of the minor planets, such as Pluto, have orbits that are tilted differently than the main planets, and objects such as comets can have orbital orientations in all directions, but the main part of our solar system is essentially flat. This makes a bit of sense. As a star forms, a protoplanetary disk also forms, out of which the planets coalesce. Since the protoplanetary disk is generally aligned with the equator of the star, the planets form with that same basic orientation. This is what we see in our solar system and in many exoplanetary systems. Of course planetary interactions over the history of a solar system can lead to changes in the orientation of certain planets. In our solar system, for example, Neptune’s moon Triton was once a minor planet like Pluto. But early in the solar system’s history Triton was captured by Neptune in a retrograde orbit. Planets that aren’t captured by a larger planet can be thrown off into tilted orbits. 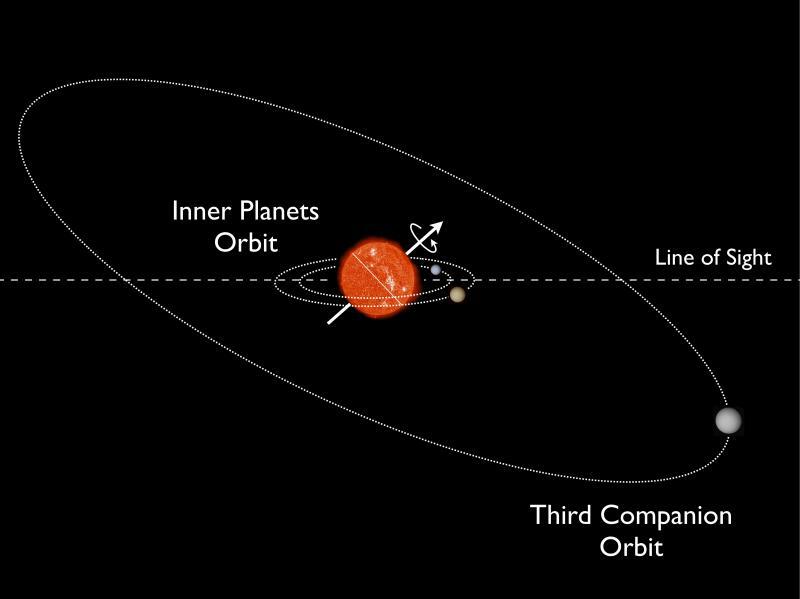 Before exoplanetary systems were discovered, it was generally thought that such interactions would just send minor planets into tilted orbits. But we soon found exoplanetary systems where some larger planets are in tilted orbits. These systems happen to have what is known as a hot Jupiter. That is, a Jupiter-type planet that is particularly close to the star. Computer simulations of forming planetary systems show that large planets tend to form early and tend to migrate inward over time. This process results in the hot Jupiters we see in many exoplanetary systems. Since planetary systems with tilted orbits have hot Jupiters, it’s generally been thought that the gravitational interactions between the large forming planet and smaller forming planets leads to the smaller ones being thrown into tilted orbits. But now a new discovery casts a bit of doubt on that idea. 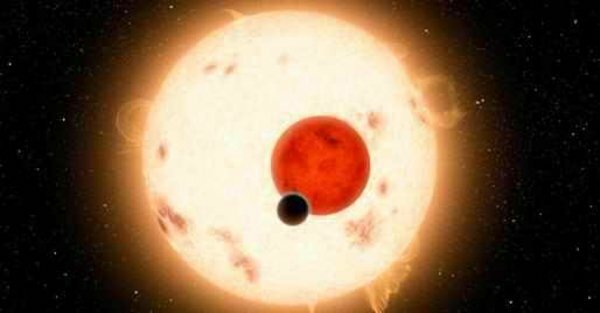 A recent article in Science finds an exoplanetary system known as Kepler 56, with two smaller planets in a common plane and a third planet in a tilted orbit. The interesting thing about this system is that it doesn’t seem to have a hot Jupiter, and the outer planet in the tilted orbit is actually the most massive of the three. However this system got this way, it wasn’t by the hot Jupiter mechanism. It gets more interesting because having your largest planet tilted relative to the others should make the system somewhat unstable. Gravitational interactions should cause the inner planetary orbits to start tilting, such as through the Kozai mechanism. But the authors ran computer simulations of the system and found that the two inner planets reinforce each other’s orbits. So the system remains stable, despite a large tilted planet. As we find more exoplanetary systems, we’re discovering that they have a much wider diversity than we expected. And we’re learning that gravitational dynamics is even more complex than we had once thought.